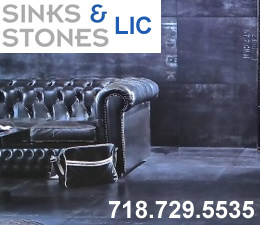 September 29, 2014 / Queens Real Estate / Bronx Real Estate & Business / News & Analysis / Gotham Buzz NYC. On Monday evening I headed over to Sunnyside Community Services Center to attend the Hunters Point South Affordable Housing meeting. 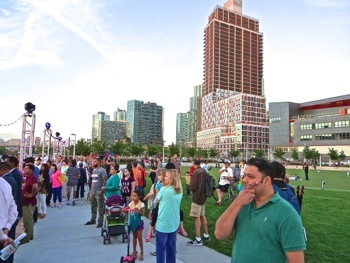 Several years ago the Hunters Point South development was approved by Community Board 2 and subsequently approved by the New York City Council and former Mayor Bloomberg. 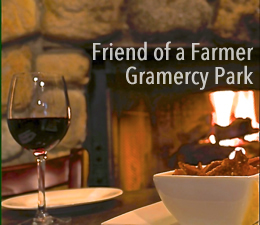 Click the link above to read the earlier report. Click here to read the rest of our report, including a photo slide show of the presentation of NYC [Bronx] Affordable Housing in Hunters Point South in LIC Queens. 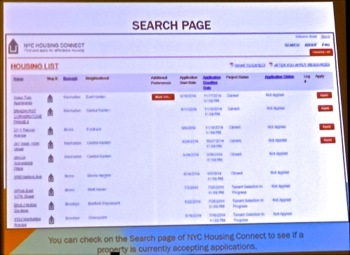 I left out most of the presentation that dealt with how to set up a Housing Connect Profile and how to fill out the online application as it seemed pretty straightforward and you can also call the NYC Housing Authority [aka NYCHA] if you need help. 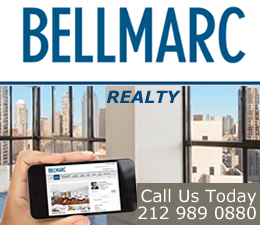 September 29, 2014 / Queens Real Estate / Bronx Real Estate & Business / News & Analysis / Gotham Buzz NYC. Continued. NY City Councilmember Jimmy Van Bramer, NYS Assemblywoman Cathy Nolan and Community Board Chairman Joseph Conley all kept their remarks brief in order to let the representatives from the Related Companies and the NYC Housing Authority [aka NYCHA] tell the audience about the buildings and apartments that were to be leased and how to go about applying for them. 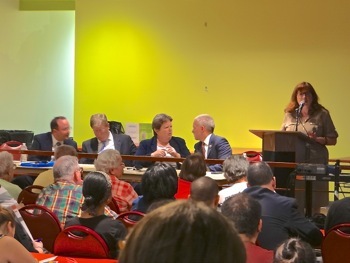 We have included photos of the Related Companies slide presentation as well as a few from the presentation given by NYCHA, but we recommend you contact the Related Companies, NYCHA or NYC Coucilmember Van Bramer or NYS Assemblywoman Nolan to be sure you have complete information. The Related Companies talked about the two towers in which the Affordable and Low Income housing would be placed: Hunters Point South Commons and Hunters Point South Crossing. 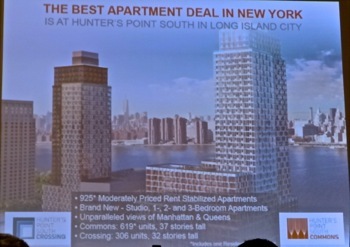 The Hunters Point South Commons is the larger building rising 37 stories high with 619 units of affordable and low income housing and the Hunters Point South Crossing rising 32 stories high with 306 units of affordable and low income housing. Of the 619 units in the HPS Commons, 124 of them will consist of low income housing, while the remainder will be moderate income housing. Of the 306 units in the HPS Crossing, 82 of them will consist of low income housing while the remainder will be moderate income housing. They told us the buildings are 60% to 70% completed and are on schedule to be completed in Spring of 2015. And that a Hunters Point South team [I believe of Related Companies] would be handling the applications. Hunters Point South was developed by Related Companies in collaboration with Phipps Houses, a non profit housing organization run by Adam Weinstein. Related Companies specializes in developing luxury / affordable housing in large metro areas across the nation. Related Company Founder Stephen M. Ross got his start in the 1970's by seeking real estate tax breaks and incentives - first for clients and then for himself - eventually founding the Related Companies. The Hunters Point South buildings will have 24 / 7 doormen. Pets are welcomed, but are limited to weight of 75 lbs or less. There are 250 parking spots in Hunters Point Commons which will be leased on a first come - first serve basis. Heat and hot water are included with the rent. Both buildings are non-smoking. Both buildings include hurricane-resistant measures such as back up generators and the housing of the infrastructure components on higher floors [versus in the basements]. 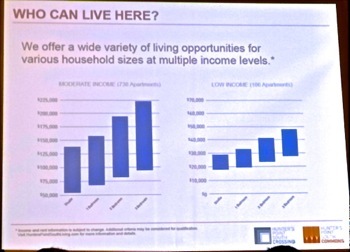 The incomes required to qualify for the low and moderate income housing are based on percentag es of the AMI or Average Median Income for NYC as a whole - not Queens. The qualifying HOUSEHOLD income for Low Income Housing units are calculated at 40% and 50% of AMI [Average Median Income for NYC]. These incomes range from about $18,000 to $38,000 for the 40% of AMI to about $24,000 to $49,000 for the 50% of AMI units. The moderate incomes required to qualify for affordable housing are set at 130% of AMI, 141% to 150% of AMI, and from 165% to 205% of AMI based on the charts provided in the handouts. What happens to those who fall in between the gaps in these percentages currently eludes me, but I'm checking. 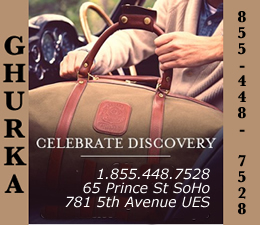 The qualifying income ranges for the three categories named above are [respectively]: 1) about $55,000 to $162,000, 2) about $60,000 to $160,000, and 3) about $70,000 to $222,000. I found it interesting to note that anyone making over $196,000 per year [among the top 5% of income earners in the nation] are eligible to compete for affordable housing. One might want to ask former Mayor Michael Bloomberg and other government officials about the public policy value of helping households in the top 5% income bracket [according to the 2013 U.S. Census and who earn hundreds of thousands of dollars each year] qualify for affordable housing. The rents for the low income units are as follows: a) Studios go for between $494 - $640, b) 1 BR goes for between $533 - $689, c) 2 BR goes for $648 - $835 and d) 3 BR goes for $743 - $959. 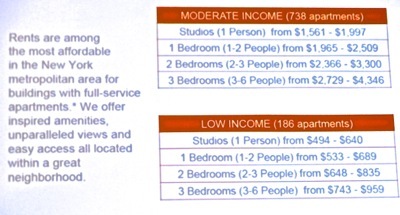 The rents for the moderate income units are as follows: a) Studios go for between $1561 - $1997, b) 1 BR goes for between $1965 - $2509, c) 2 BR goes for $2366 - $3300 and d) 3 BR goes for $2729 - $4346. They also set a limit on the number of people which are that studios house only one person, 1 BR house up to 2 people, 2 BR up to 4 people and 3 BR up to 6 people. I thought it might be of some value to cross reference the annual Hunters Point South rents for the low income and affordable housing units relative to the annual household income of Queens. The U.S. Census reported that the median annual household income for Queens was just under $58,000. 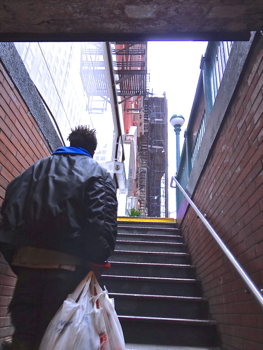 How Affordable Is Hunters Point South 'Low Income' 'Affordable' Housing? Hence the low income units of Hunters Point South are great value at about a bit over $7,000 per annum for a studio and a bit under $12,000 per annum for a three bedroom. These units appear to be very affordable. According to the Coalition For The Homeless, in January of 2014 there were nearly 54,000 homeless, of which nearly 23,000 were children. This was another all-time high record. I attended a housing seminar in September 2014 where they provided an update of these numbers which had climbed to 57,000 homeless in NYC shelters and they estimated there were another 3,000 living on the streets. 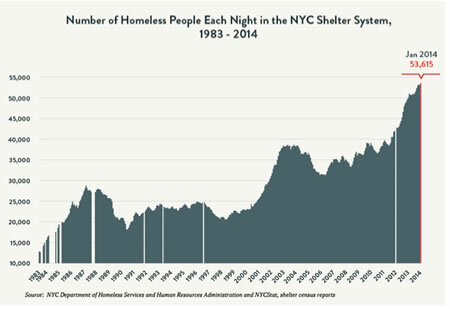 The homelessness rise grew aggressively during the course of former Mayor Bloomberg's terms - more than doubling from the low 20,000's to the 54,000 tally when he left office. Bloomberg began to address the issue by incenting developers to build 'affordable' high rise luxury housing. Mayor de Blasio ran for Mayor on a theme of The Tale Of Two Cities - talking about how the richer got richer as the poor became poorer. One of the challenges in meeting NYC's housing needs is to balance the need by private enterprise to make money and careful management of taxpayer funds with social and moral obligation to live up to the American dream of providing all humans with Equal Opportunity. For those 23,000 children currently living in homeless shelters during the formative years of their lives, equal opportunity is but a dream. It would be hard to concentrate and get a good education when their family life is so unstable. Government solutions to the problem of providing housing to the poor have a questionable track record at best. One of the solutions was to build large government-owned buildings and to rent them to the poor. In past decades these became the front lines to the drug wars and centers of racial strife. But a lot of that has begun to fade into the past. Because the public perception of public housing was established during the drug wars, one of the challenges facing public housing is that it carries a historical stigma. The intelligent aspect of creating public housing was that it addressed the housing supply shortage in order to balance the supply and demand scales of capitalism in favor of providing ample supply which in turn helps keep prices down. Another solution was to provide tenants with government subsidies. This actually worsens the problem as it artificially increases the demand and subsequent prices for housing. And a third solution was rent control. Rent control is established whereby the government sets a limit on the amount [percent] of increase that a landlord is allowed to raise rents. The problem with this solution is that it discourages investment in housing supply as real estate investors want to be able to set their own prices. The Bloomberg solution was to incent private real estate developers to build high rise luxury buildings that include some allocation of low income and moderate income 'affordable' housing. Like public housing this approach addresses the supply side of the capitalist equation of supply and demand. 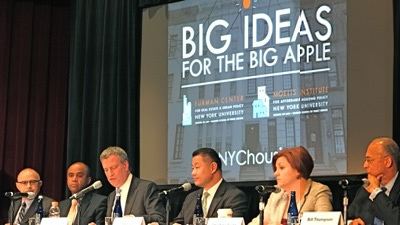 De Blasio appears to be following the same line of thought in pursuing a solution to the housing shortage in NYC, by expanding private developers investment opportunity in exchange for 'affordable' housing. One other approach to addressing NYC's housing shortage has been to allow landlords to rent subterranean units [basements] which are currently illegal as there are issues with escaping fires and the air quality because renters would be living with the building infrastructure such as sewage / plumbing and furnaces. 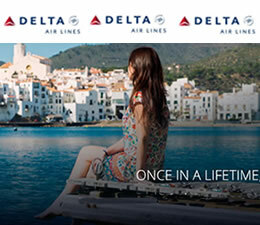 Affordable In Name Only: Is Paying 33% to 91% Of Median Household Income Affordable? One can fairly ask how NYC government officials arrived at the moderate income rental valuations which run from a low of about $19,000 per annum for a Studio to about $53,000 per annum for a three bedroom apartment in LIC. Given that half of the households in Queens earn less than $58,000 per annum, the three bedroom apartments are completely unaffordable. Once the tenant pays their annual rent, they would have $4,000 left for all other living expenses for the entire year. 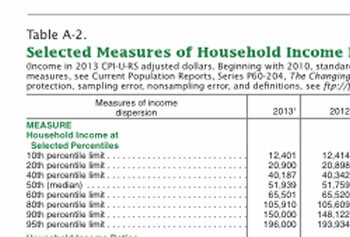 And this is an example of someone in the middle of the household income pack with four to six people in the household. Historically between 25% and 30% of income was considered a 'fair' amount of one's income to allocate to rent. Yet the Hunters Point South moderate income affordable housing appears to be 'affordable' in name only, as the rent allocations range from a low of 33% to 91% of the Queens borough median income. Given these percentages were calculated using the income at the top of the lower half of household income in the borough - these rents do not appear to reflect moderate or affordable to Queens residents. Former Mayor Michael Bloomberg negotiated the deal, which also included city funded development of Hunters Point South Park [5 acres of waterfront park], city funded underlying infrastructure such as roads and sewage, a generous terms lease for the NYC Housing Preservation and Development lands upon which the development resides, along with other tax incentives and tax breaks. Mayor Bill de Blasio criticized Bloomberg's deals with NYC real estate developers during his 2013 campaign for Mayor saying that Mayor Bloomberg had not negotiated very hard for the interests of NYC citizens. In 2009 NYC bought the 30 acres upon which Hunters Point South resides for $100 million from Empire State Development Corporation [NYS] and the Port Authority of NY / NJ. HDC issued $236 million in tax exempt bonds and HPD providing $68 million in subsidy, while the developer contributed $27 million in equity. The Related Companies has a second Bloomberg affordable housing development underway at CitiField. There are two pieces to it. 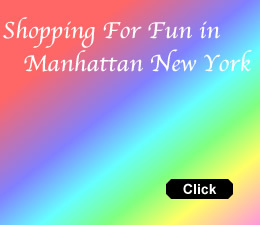 One segment is a mega shopping mall being developed in tandem with the Sterling Equities [owned by Wilpons who own the Mets]. And the second segment is a mixed housing, retail, school and office space development. The joint venture is called Queens Development Group. In the latter deal, former Mayor Bloomberg essentially gave the Queens Development Group [owned by Stephen M. Ross & Fred Wilpon] a 23 acre site next to CitiField at Willets Point for $1 which in November of 2013 the Queens delegation of the NYC Council approved. NYC also approved $43 million in tax breaks to the Queens Development Group. The real estate development will be built on what is technically the public parkland of Flushing Meadows Corona Park. In this case former Mayor Bloomberg used imminent domain to forcibly remove the landowners from their property in order to pave the way for the mixed use development which will include affordable housing [likely structured along the same lines as done at Hunters Point South], as well as a hotel, retail space, a school, parking and office space. There were several legal skirmishes in the process of concluding this deal which included the illegal execution of imminent domain by the Bloomberg Administration to remove landowners. The Bloomberg Administration also conducted illegal lobbying efforts - wherein NYC funds were used to fund the lobbying of NYC on this project - by a local economic development group lead by former Queens Borough President Claire Shulman. 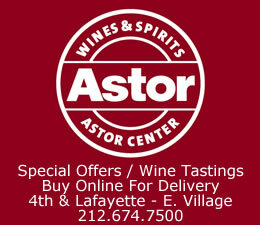 Click here to read a bit more about the Flushing real estate development by the Related Companies. On August 20, 2014 New York State Supreme Court Judge Manuel Mendez decided that a lawsuit citing that NYC broke the law by not properly executing the Uniform Land Use Review Procedure [ULURP] was invalid. How Competitive Is Hunters Point South 'Moderate Income' 'Affordable' Housing? I went online to review the current market rates for apartments comparable to the new Hunters Point South buildings to see at what prices they were leasing. Generally the affordable housing rents were leasing at discounts of between 10% to 53% versus the market rates I found in a online. *Editor's Note: I spent only a couple minutes looking up these rents, so I'm pretty sure you could find better open market rents than I did by looking harder and / or negotiating. 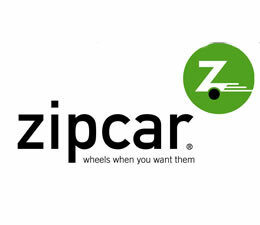 There's a preference built into the application process that favors local residents. Specifically this means people who already live in the area served by Community Board Two [see map] which serves Sunnyside, and parts of LIC, Woodside and Maspeth. 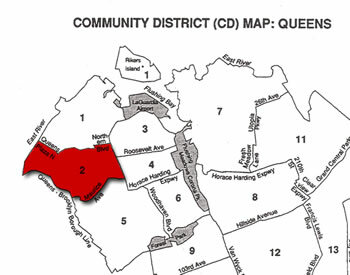 If you're unsure whether you live in the district, you can contact the Community Board 2 in Queens by emailing them at qn02 @ cb.nyc.gov or contacting the offices of NYS Senator Gianaris, CCM Van Bramer or NYS Assemblywoman Nolan. So preferences are given as follows: 1) 7% of the units for visual, hearing or mobile impaired, 2) 5% of units for NYC employees, 3) 50% for those who live in Queens Community Board 2 District, and 4) 38% have no preference bias. There are a total of 924 apartments allocated, of which 186 apartments are allocated as low income housing and 738 apartments are allocated as moderate income housing. A spokesperson for NYCHA was present to guide the audience through the affordable / low income housing application process that starts in the middle of October. You can approach the application process via mail, in which case I'm going to refer you to the Related Companies or CB2 - using contact info in the slide show below. 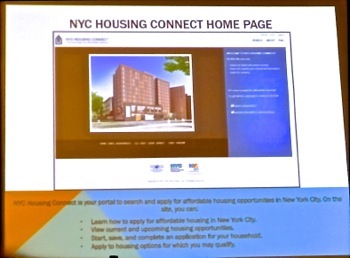 Or you can set up a profile in NYC Housing Connect and apply for affordable housing there. You can set up the profile at any time. And then monitor housing openings via the search section, which is where the Hunters Point South affordable housing units will be shown when the application process begins. They took us through the process, which includes setting up the profile, supplying them with income / tax information, including all income from the household and being careful to check the application before submitting it. Those will be received and after the beginning of the year they will begin the interview process where you willbe asked to bring the info and come prepared to answer questions as they will beverifying the information contained in your submission. Background checks in including credit and criminal records willbe included in the process. I believe they said they are planning to place the units on the Housing Connect system on October 15th, 2014. You'll see it in the Housing Connect search section when it opens. The following slide show contains photos Hunters Point South Affordable Housing Meeting in Sunnyside. Click here to go directly into the photo album containing Hunters Point South Affordable Housing Meeting in Sunnyside. Special thanks to Community Board 2, Chairman Conley, NYCCM Van Bramer, NYS Assemblywoman Nolan and absent but supportive NYS Senator Gianaris for organizing these public information meetings. There are two more sessions [10/1 and 10/8 at different locales - see the business section of things to do in Queens calendar for time / locale details. Several years ago the Hunters Point South development was approved by Community Board 2 and subsequently approved by the New York City Council and Mayor Bloomberg. Click the link above to read the earlier report. Click these links to gain a broader perspective of the Long Island City Neighborhood in which these units reside.